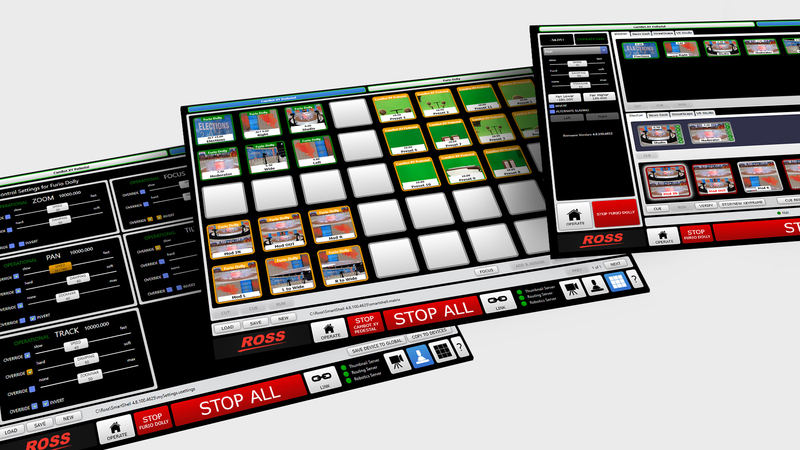 All Ross robotic solutions can be controlled from a flexible, intuitive user interface that can be scaled to suit both large and small installations. SmartShell 4 Control System combines a touchscreen interface with an ergonomic joystick control panel. Whether you have Furio dollies, free-roaming CamBot pedestals, PT heads or BlackBird pedestals, all of your Ross robotic systems can be controlled by a common control system using a centralized Ethernet-based architecture. Simplified and straightforward solution scales easily from a simple two head studio to more complex Studio Automation and Multi-Camera Control environments. Operators enjoy a responsive and ergonomic joystick panel designed to control all types of robots, from simple pan and tilt heads, to Furio dollies or free-roaming CamBot pedestals. Memorable moving shots are created by building complex sequences of keyframes using Furio Moves*, which can then be perfectly recalled and reproduced over and over again. The system offers the flexibility to store and recall an almost unlimited number of camera presets, eliminating the need for constantly uploading or synchronizing show files, while providing a simple and easy to use interface for organizing and accessing presets. User Settings allow each user to tailor the interface to their specific preferences, from joystick configuration to the layout of shots in the matrix for a particular show. Each SmartShell control station communicates with the robots using native IP-based protocols over an Ethernet infrastructure, simplifying integration into new or existing facilities. Centralized IP-Based architecture includes a separate Robotics Server that simultaneously supports every control station within a facility and consolidates robotic control data, simplifies control station redundancy, and easily pools and shares all robot resources between control stations. Precision joysticks and knobs provide responsive inputs for all robotic axes, while backlit buttons provide direct access to most commonly used functions and indicators. Joystick view provides a complete view of all joystick axes at once, allowing the user to customize settings for each robot independently. Settings can then be saved to a file, so that each operator can have their own personal configuration, without worrying about what previous users may have changed. Presets and Moves can be organized in tabs allowing you to group shots by show, scene, operator or anything else you desire, making it easy to manage hundreds or even thousands of shots from across your productions. Matrix view provides direct access to a consolidated matrix of Presets and Moves* from any or all of your connected cameras. Matrices can be saved, shared and recalled so that a different matrix can be created for each show or segment as desired. Each SmartShell station consists of a Windows PC running the SmartShell application, coupled with an Unified Control Panel. 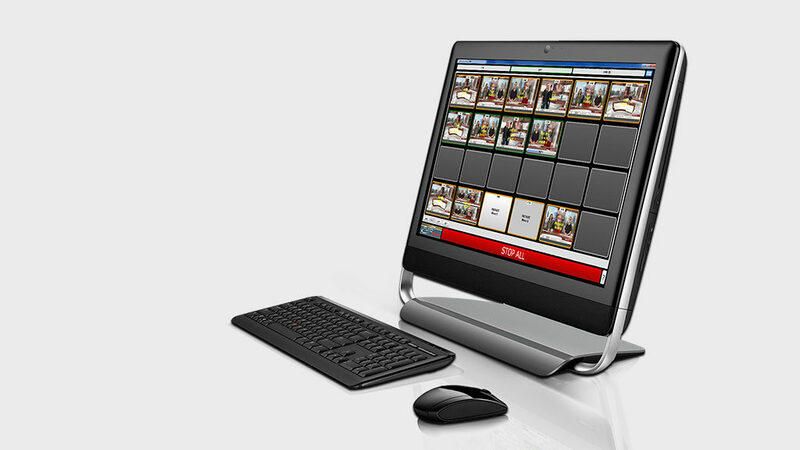 Standard configuration is an All-in-One Touchscreen PC, that minimizes control station footprint. Also available is an Integrated Server version that is based on a compact desktop PC with a separate touchscreen display. This version also includes all of Robotics Server functionality, eliminating the need for a central server, making it suitable for smaller installations where only a single control station is required, and control station redundancy is not a priority. The SmartShell control panel combines high quality joystick controls with direct access to key functions in a polished, ergonomic unit. Available in both single (3-axis) and dual (6-axis) joystick configurations, the more cost effective single joystick model is perfect for simple pan/tilt environments, while the higher end dual stick model is required for systems that include tracks or pedestals. 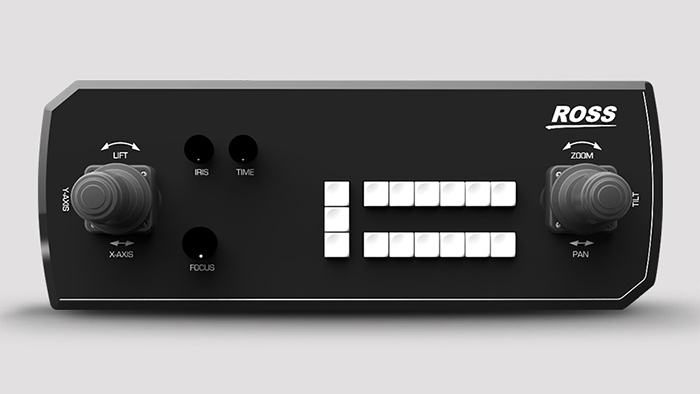 To minimize latency, the joystick panel communicates directly with each head, providing a responsive and natural feel. Configuration menus in the SmartShell GUI allow for complete customization of every axis, allowing each user to tailor joystick performance to their own personal preferences. 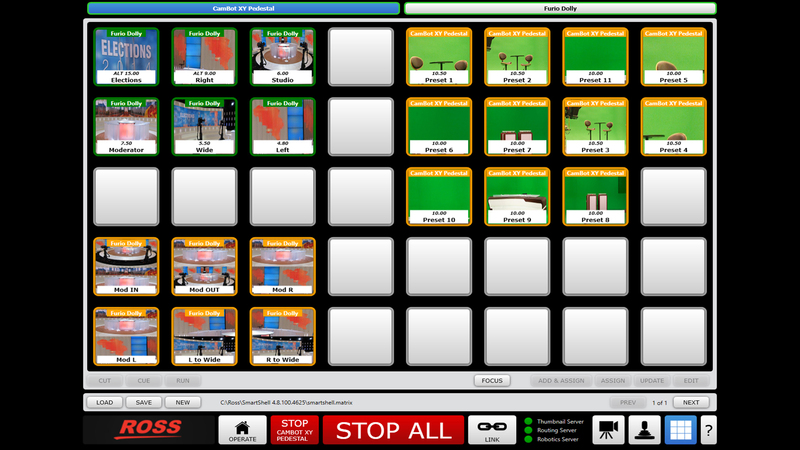 SmartShell 4 graphical user interface (GUI) provides a simple, easy-to-use interface for creating, managing and recalling shots on all your Ross Robotic cameras, helping deliver consistent, high quality productions without sacrificing creativity. Robotics Server provides centralized storage and management for thumbnails, communications with robotic systems*, and router control. With the ability to simultaneously support every control station within your facility, this central server architecture consolidates robotic control data*, simplifies control station redundancy, and easily pools and shares all robot resources between SmartShell control stations.